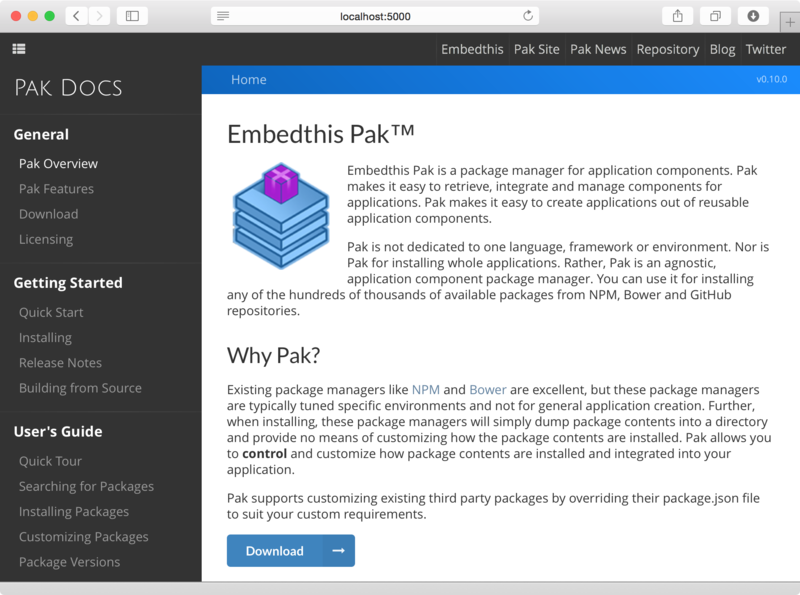 Embedthis Pak is a package manager for application components. Pak makes it easy to retrieve, integrate and manage components for applications. Unlike other package managers, Pak will automatically install and configure downloaded packages — no more manual file installation each time you upgrade a library. Read why Pak is unique and perfect for your application. Fast, fast, fast. Did I say fast? You can access the documentation and Samples or just read the Code to help yourself. Pak is open source, so you may log bugs and open issues on the Pak Issue Database. Want to help the Pak community as a contributing developer? You'll find Pak is very easy to hack and extend. Read about how to create patches and join the fun.